All you need to know is here! If postings appears to be rare, it’s because I’m out there enjoying Norway in the most fantastic summer we’ve had since 1947. Let me correct that: The most fantastic summer since 1947 in the South of Norway. In the North, the weather is record-breaking miserable, although at time of writing this, it seems to clear up a bit. Anyway: In the South, we’ve had a steady state of sun and warmth – real warmth – for some two consecutive months. 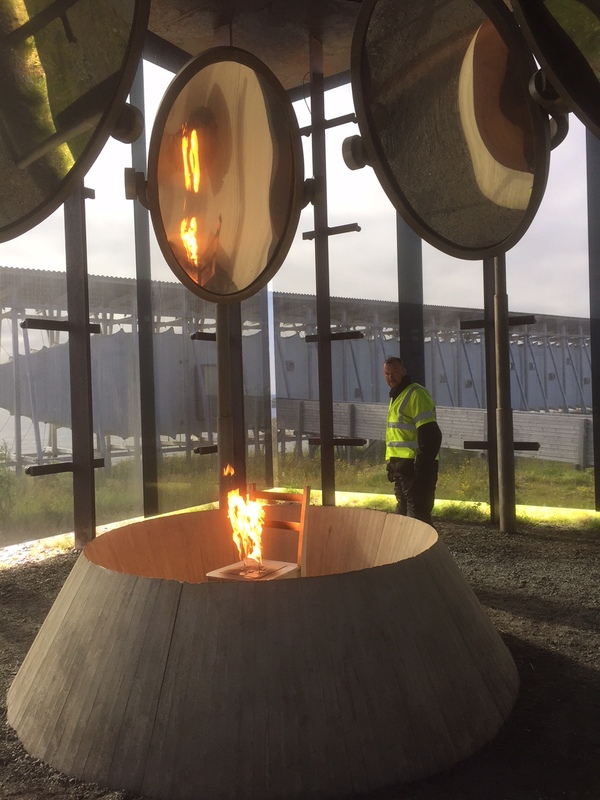 Oslo has been the warmes capital in Europe for a while, and it’s so dry that there is a total ban on open fire everywhere. In the South, I mean. Up North, you can still light your barbeque, if you find that comforting. This, of course, calls for adventures! There are plenty of bikes roaming the roads everywhere, and I hope some of you had the chance to experience this. I am, so if you find postings rare, it’s because I’m out there. 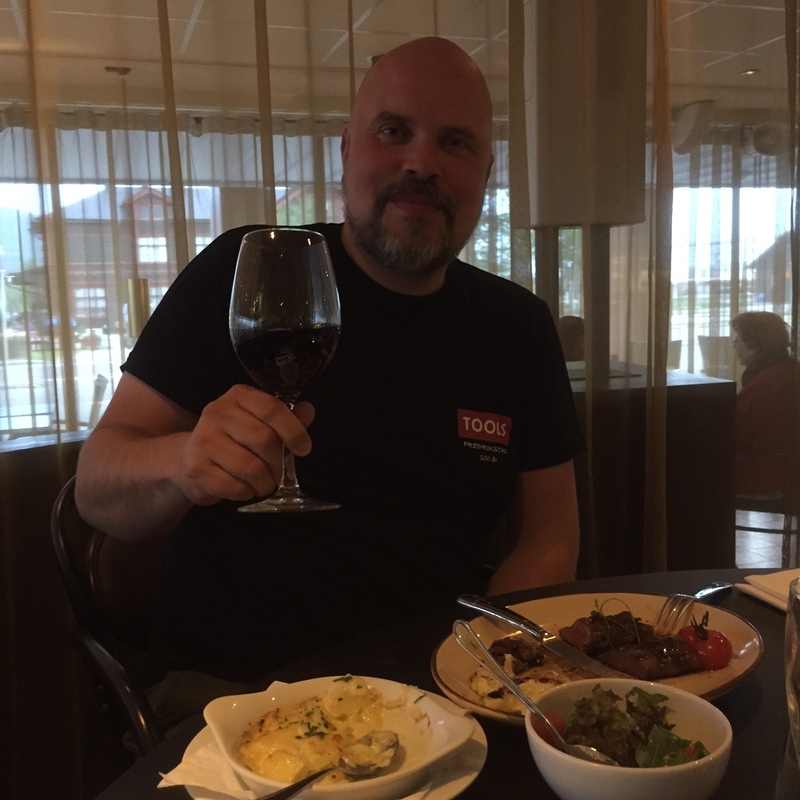 In Hardanger, Fjorda, Stryn, Hornindal, Fiskevollen – boy, this is a summer to remember. I hope to see you on the road somewhere! Have a great summer! Because we also host Keiko the Orca’s grave (lead character in the movie “Free Willy”), the Hessdalen Phenomenon (some say it’s UFOs), a leprosy museum (500 years old) and the world’s steepest road tunnel (15.5% climb!). 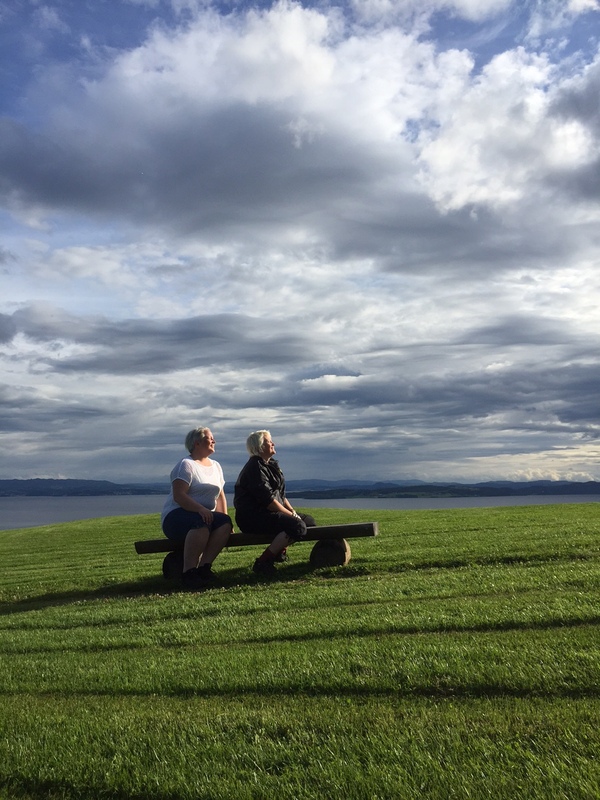 Check out the odder sides of Norway! All the best for 2018 to all of you! Hope to see you on the road somewhere in Norway! 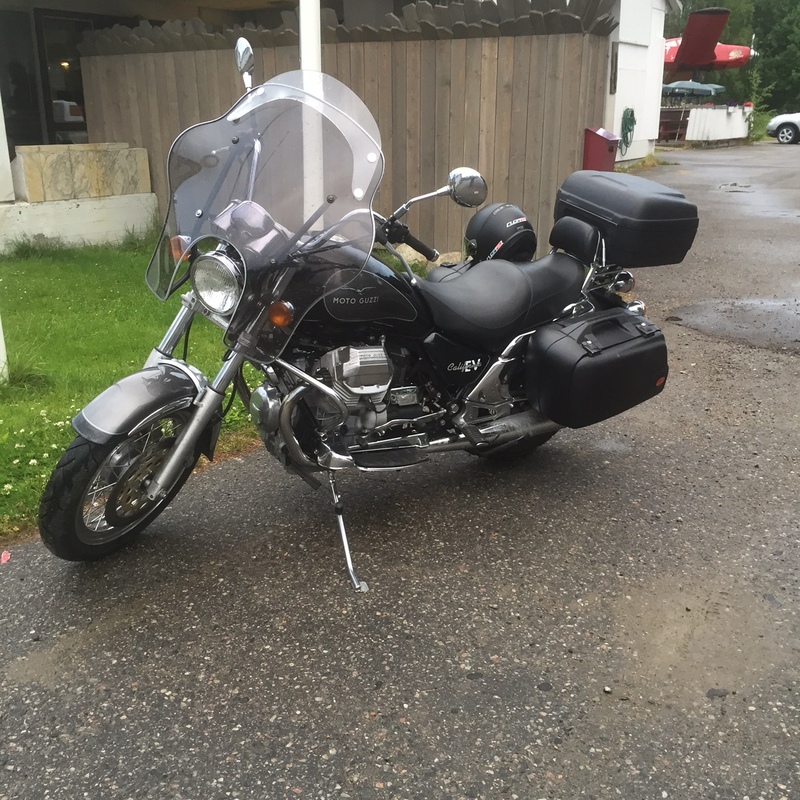 I took my new (to me) 1990 Guzzi SP3 for its inauguration trip to meet fellow Guzzisti at Oldevatn camping, not very far from Geiranger. This part of Norway is famed for its stunning beauty, and this weekend it certainly showed off in all its splendour. I took Friday off from work, so I left for the rally on Thursday afternoon. It´s some 500 kms from where I live to Olden, so I opted for a stay-over at Lom. I chose a route which is not the fastest, but nevertheless pretty: Up to Fagernes, Road 51 over Valdresflye, the Stryn mountain road to Stryn and onwards to Olden. The bike ran flawlessly, apart from showing signs of a worn clutch boss, which of course is about to be fixed. Valdresflye mountain road is one of the 18 National Tourist Roads. 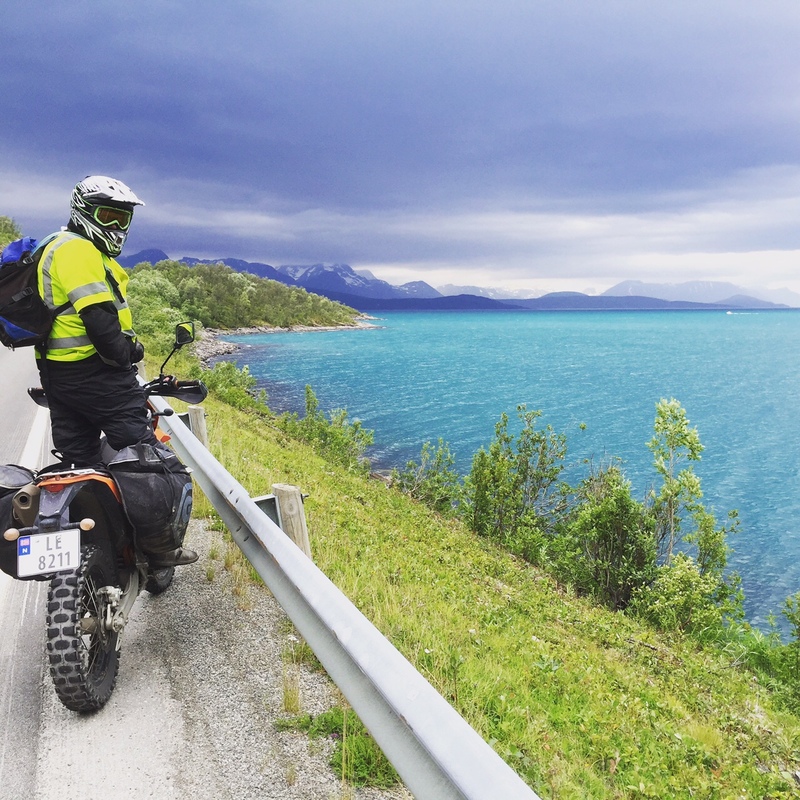 The Valdresflye mountain road – Road 51, one of the National Tourist Roads – is closed during winter, and opened for the season not many weeks ago. There is still some snow up there, but not on the roads, of course. It gets a bit chilly up on the top, so when you ride there – use your extra layer of clothes under your riding gear. In the summer there tends to be quite a few camper vans and other slow-moving tourists on the road, but as there is no vegetation to hamper the view of any oncoming traffic, they are easily overtaken. After a rather unspectacular night at Lom, I did the last leg down to Olden over Stryn mountain road – Road 15. This road meets Road 63, which takes you down to the famous Geiranger fjord (also only open in the summer). But I kept following Road 15 towards Stryn. The Stryn Mountain Road is tried to kept open also in the winter, but it´s frequently closed due to heavy snowing combined with tough winds. In the summer, it´s usually a tranquile, nice piece of mountain road with spectacular views. Be aware, though, that the tunnel starting the downclimb towards Stryn is VERY dark! Do not use sunglasses or tinted visors when you enter! The trick is to close one eye before going into the tunnel. When you´re inside and open it, your eye should have adjusted somewhat to the darker surroundings. There are three longer tunnels leading down to Stryn. Take precations when entering them. Just in case. Stryn has a slogan – “Beautiful Stryn” – which is somewhat generic, but in this case it fits the area. The Stryn area IS beautiful! As is Loen, Olden, Utvik Mountain Road, et cetera. You cannot go wrong wherever you choose to point your front wheel. The roads may be considered somewhat narrow, but on a bike this is not a problem. Be aware of the many coaches carrying cruise ship passengers to sightsee the Briksdal Glacier. Or what´s left of it. Also – if you really want to part off with some cash, try the newly opened SkyLift cablelift in Loen. It´s some 50 euros, but those who do it says the view is awesome at some 3000 ft above the sea level. 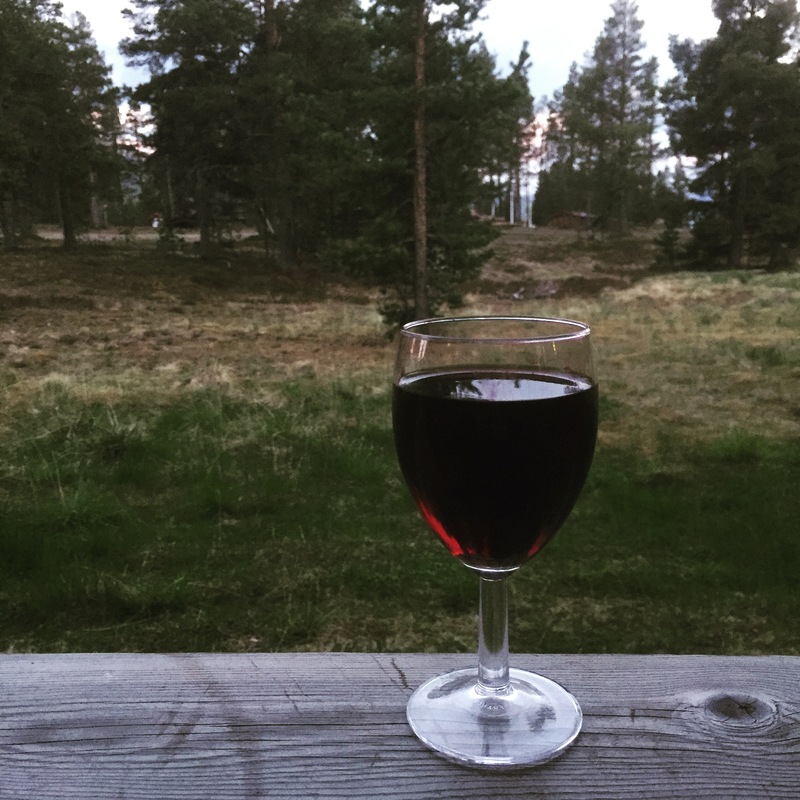 I have stayed at the Oldevatn camping several times, and prefer this to any over-priced hotel accomodation: Due to heavy tourist traffic, accomodation prices tends to be in the higher end of the scale in the summer. But the camp sites are usually set at wonderful sites, and renting a cabin for a night or two shouldn´t break your budget. The return ride was a rather uneventful ride in poor weather back home. But still – it was a day on the bike, which is always a good day. 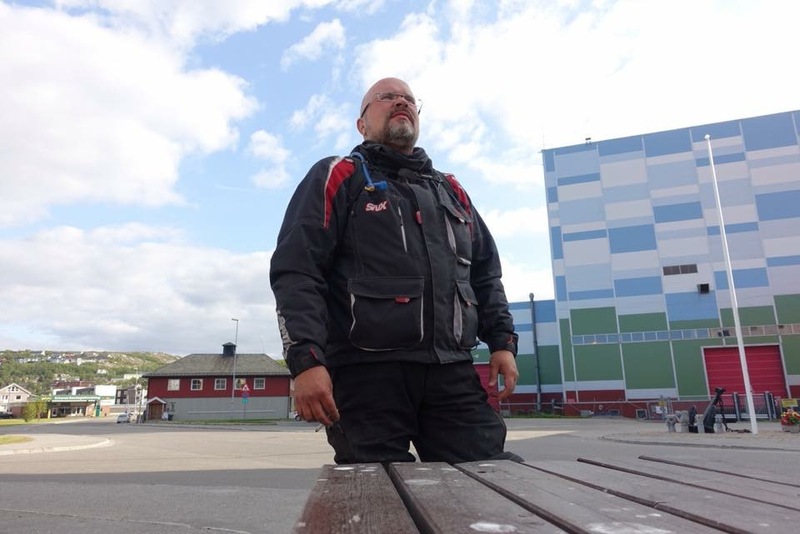 How does Norway look from the saddle of a bike? Swede Markus Vikberg rides Norway quite frequently. This is a couple of videos he shot on a trip he did on his Triumph Tiger 800 last summer with a couple of friends. Enjoy! These days, most riders are parking their bikes for the winter in our part of the world. Not so with a handful of die-hards who have their winter season inauguration rally 16 – 18 October. Ivar and Knut enjoys the early Saturday morning at the Woodgatherer Rally. Some 40 years ago, a handful of guys established the Primus Winter Rally, which is held in February each year at Fjorda in Bjoneroa, some 1.5 hrs riding from Oslo. In preparation for this rally, some of them went to the site in October to – well – chop some wood for the upcoming event. In a matter of a few years, this turned into a rally in itself – The Woodgatherer Rally. Even if there is not much wood chopping these days, the rally in itself has become an inauguration of the winter season for a handful of die-hard winter riders. Not accepting that motorcycle riding should be restricted to the summer months, they venture into the cold on two or three wheels, adapting to the winter chill with proper gear for both man and machine. The Woodgatherer Rally is always held in the first weekend after the first winter day, which is 14 October. So if you want to come and join some 50-60 fellow riders, you are most welcome. Be aware, though, that you need to bring everything you need yourself: Tent, a proper sleeping bag, food and your preferred paraffin/kerosene stove. There is no bar, showers, restaurant or hotel rooms to be found at the site (although most camps turns into some sort of bar during the evenings). What can be promised, though, is an experience you’ll remember! Check out the videos below for more info and inspiration. 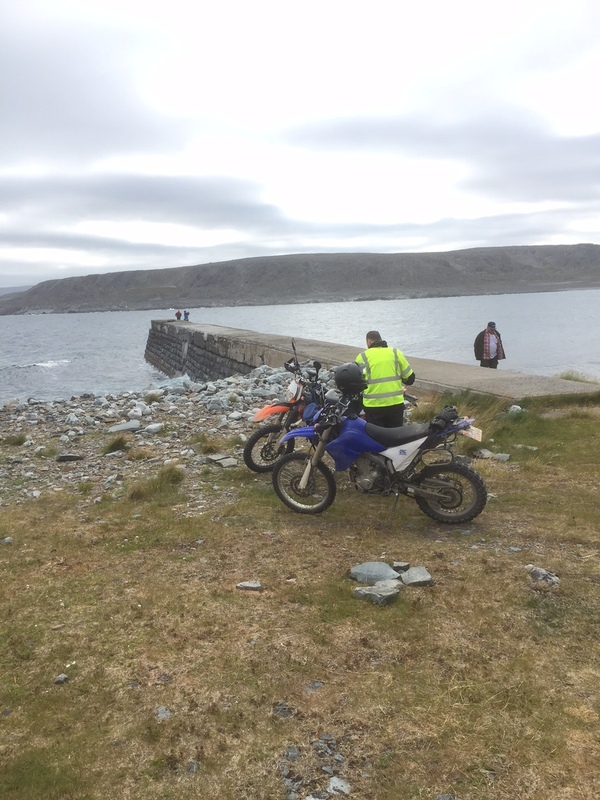 This year’s great escape was a gravel tour from Oslo in the south to Kirkenes way up north in Norway. I am from up north and had planned to go there this summer to do a few preparations for my mum’s 80th anniversary. I could of course go by plane, do my stuff, and return in a couple of days. But then again – why bother doing it the easy way when I had got hold of a GPS route that would take me and my bike by gravel through all kinds of “roads” in a week? Plus another week for the return trip? 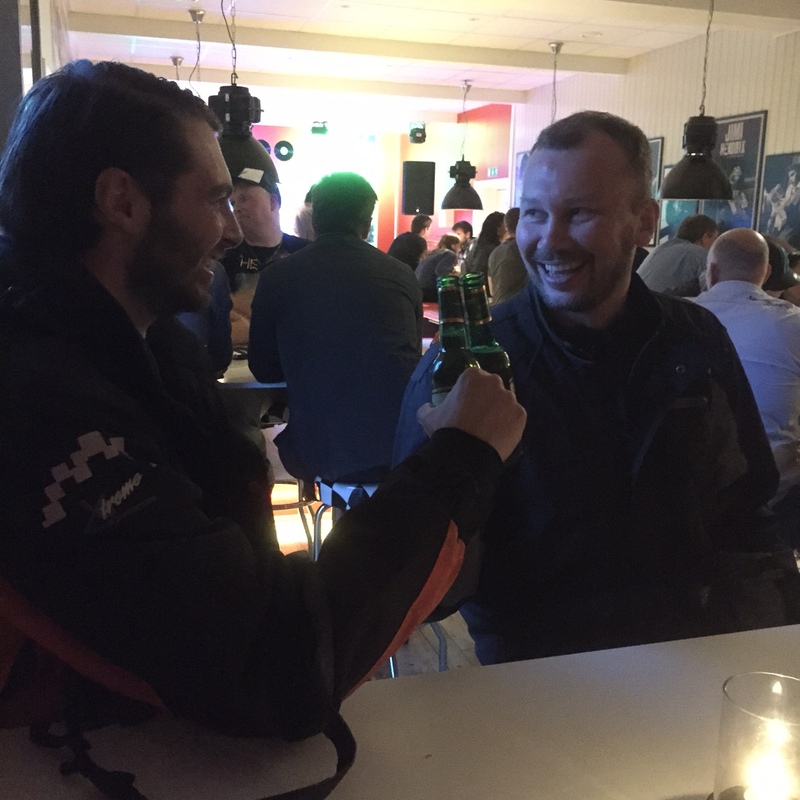 I invited a couple of riders from the local Offroad Touring Club who knew about my plans and wanted to tag along. On a trip like this I thought it would be better to be at least a couple of riders to back each other up – just in case. 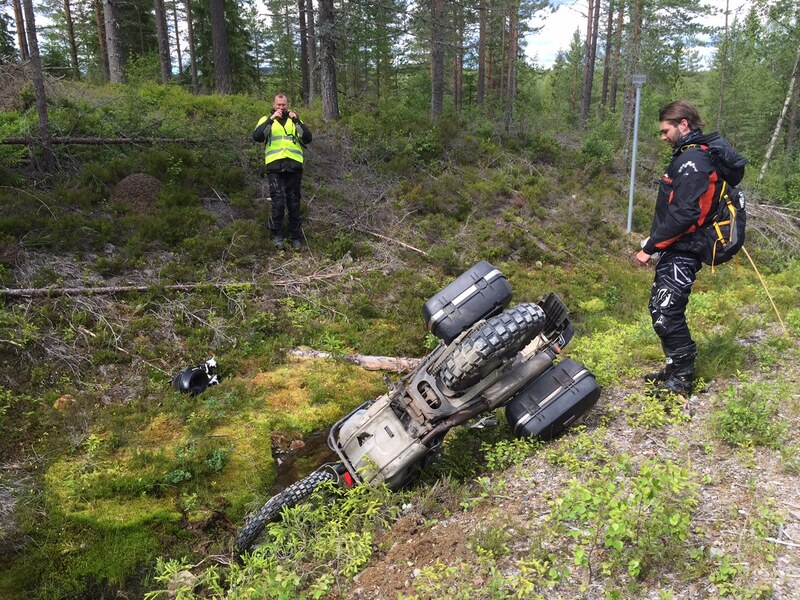 A spectacular crash on day 1, but no harm done to neither man nor machine. So Nikita, Arne and myself set out 20 July. None of us had done that trip before, so we guesstimated that it would take us some 5 to 7 days to complete the trip one way. 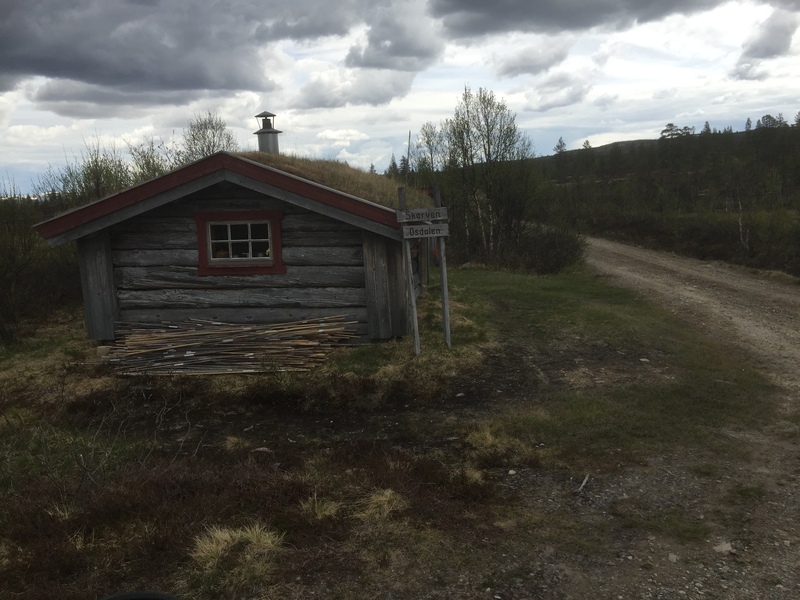 We had already agreed that the official part of the trip would end at Kirkenes, and that every man was for himself for his chosen mode, route and speed of the return trip. 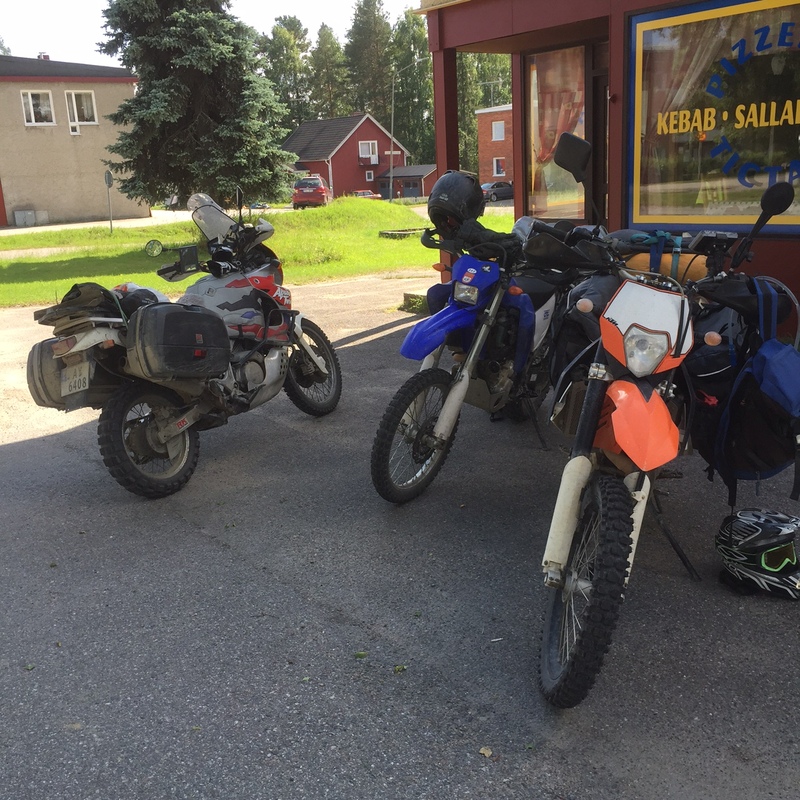 We set off from just outside Oslo, heading for Os in Hedmark county, where we would spend the night at a friend who’s an accomplished enduro rider, and whom had done the trip a few years earlier. 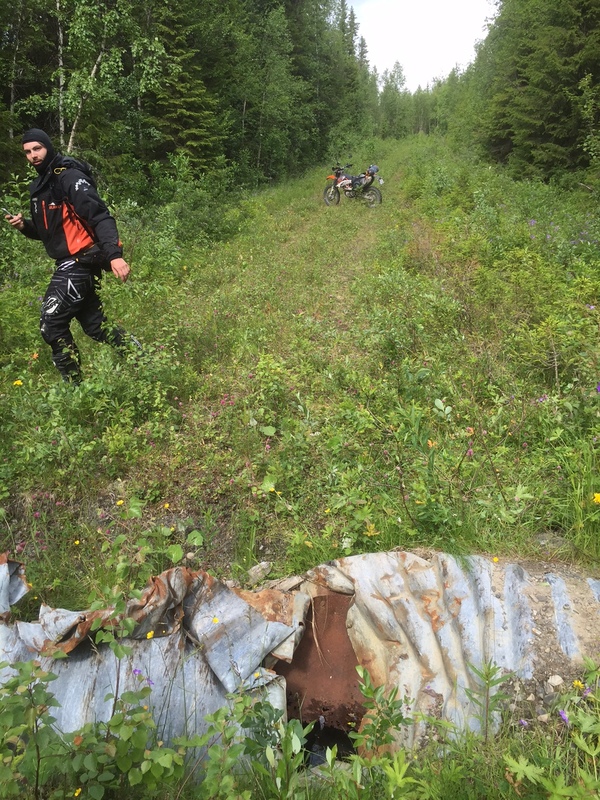 But drama set in on this first day of riding: Nikita, the freshman in the trio, misjudged a right bend, locked all wheels and went off the gravel road in quite a spectacular manner. 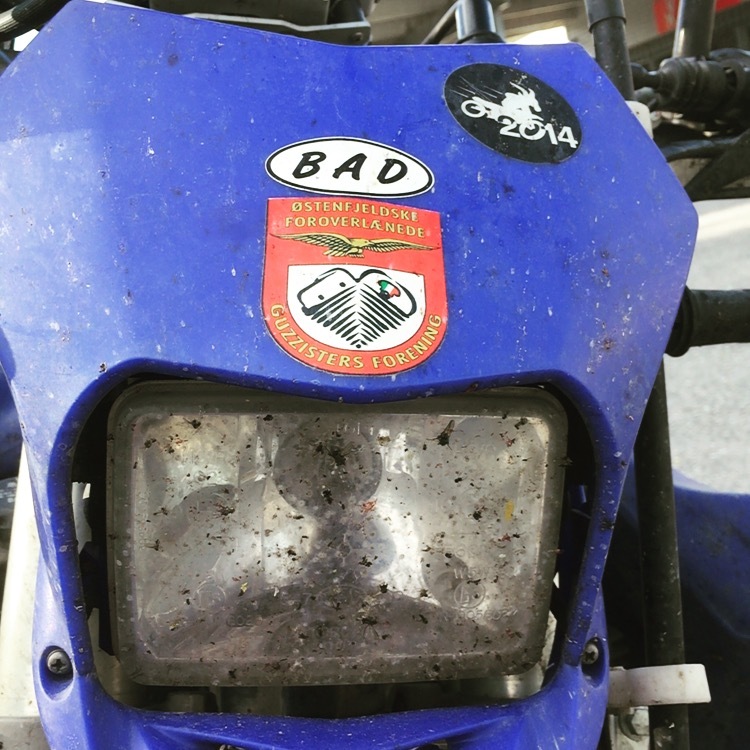 We all thought this would be the end of his trip, but luck was on Nikita’s side: No harm done neither to man nor machine, except a few scratches on the side panel of his Africa Twin and a broken indicator. A very steep learning curve indeed for our man, who learnt a lesson or two with regard to paying close attention to the road especially when riding on gravel. 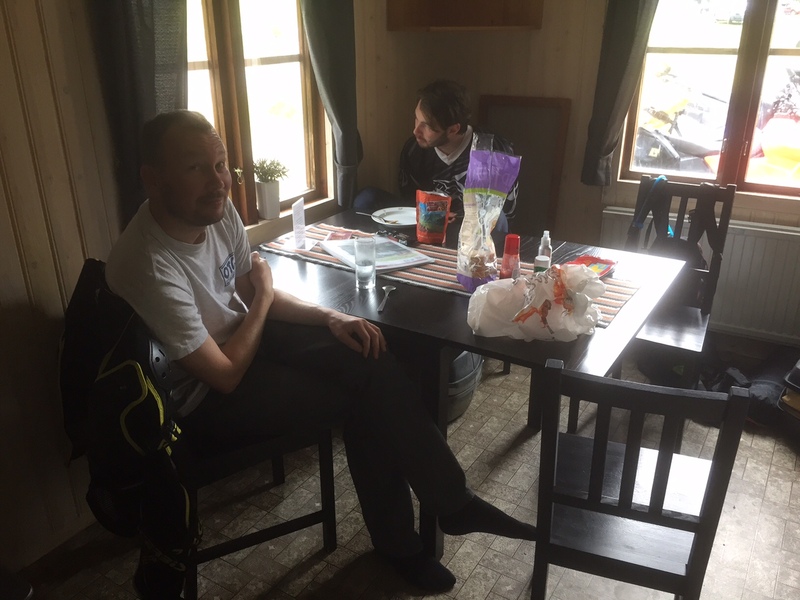 At our friend Inge’s place we were treated with a great meal and sauna, plus some advice on the route ahead of us. Arne, who was by far the more experienced gravel rider among the three of us, took care of the navigation. 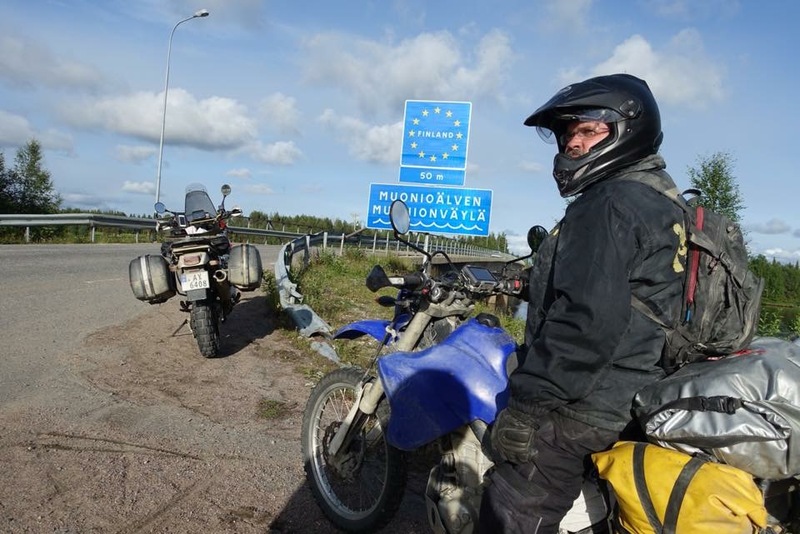 We had decided to go through Sweden and Finland in search of gravel, as it is shorter (but not necessarily faster) to go through our neighbouring countries. 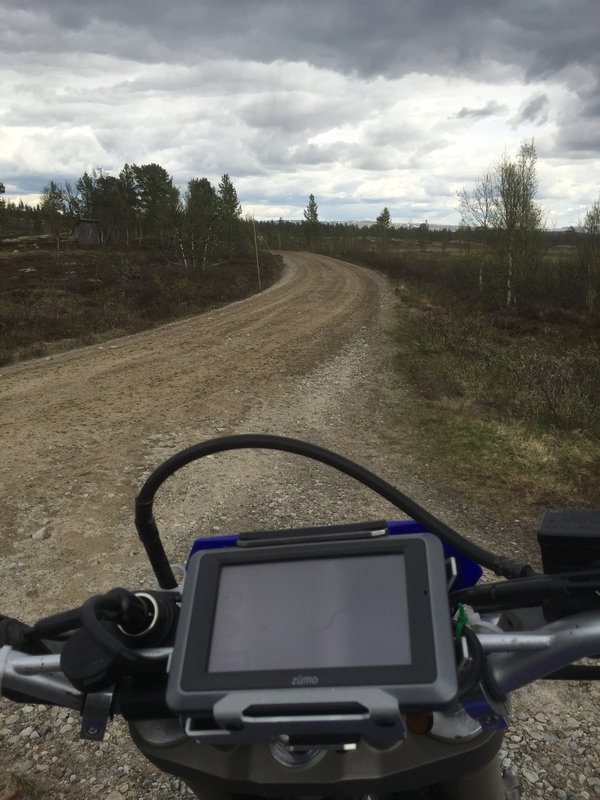 Besides, especially Sweden has a great selection of gravel roads in a variety of qualities. Day 2 took us from Inge’s place to another friend of ours, Fredrik. His family has a summer house in Sweden, so we were to meet him there for a stay-over. We were again met with a full meal and an outdoor spa-like mini pool with amenities such as Jägermeister and beer. Needless to say, we had to have a slow start the morning after. 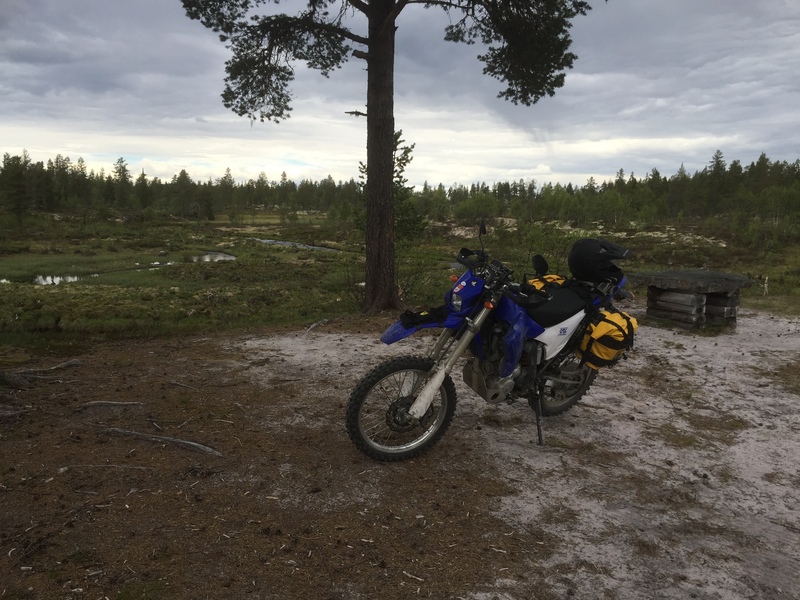 The trip through Sweden was fun, and at times rather exhausting – especially through a “jungle” with muddy tracks pretending to be roads. The heavy rain in the days prior to our trip had turned it all into a swamp, and – of course – the air was quite .packed with mosquitos and midges. At least they served as great motivation to get us as fast as possible out of the swamp. 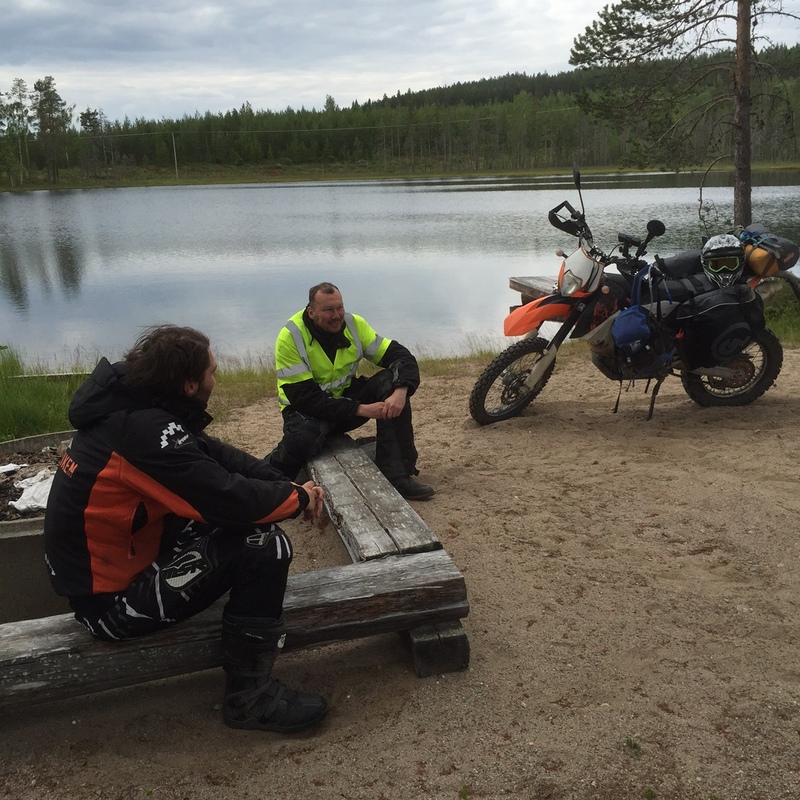 The northern parts of Finland had plenty of gravel roads – but not so many that went all the way through. They tended to go in to a cabin or something, and just end there. So we were forced to do quite a few miles on asphalt. Not so much fun, but at least the area is pretty to look at. 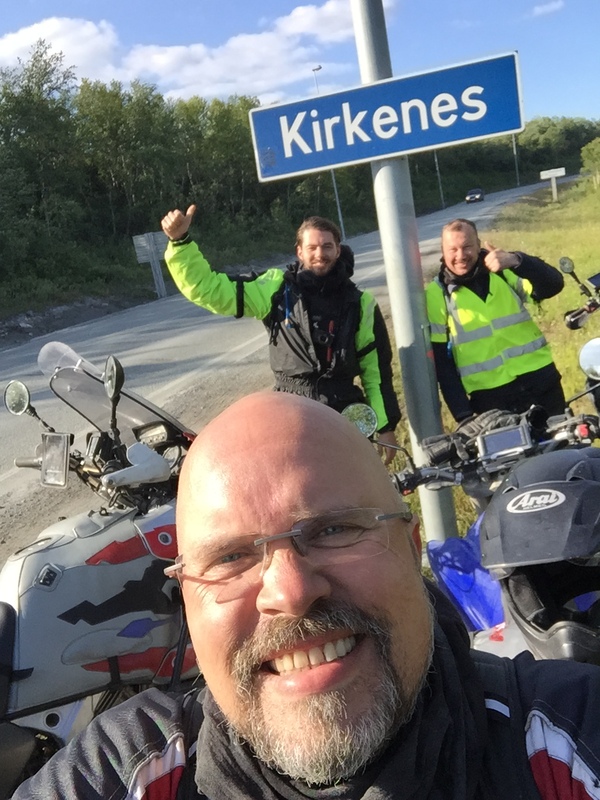 After 7 days of riding we crossed the border from Finland back into Norway and finally arrived at Kirkenes. Even though many have done this trip before, we had a high sense of accomplishment. Before we split, we toasted in coffee and ice cream and decided it had been a great trip. Actually so much that at least a couple of us wanted to do it again sometime. But that will be another story. 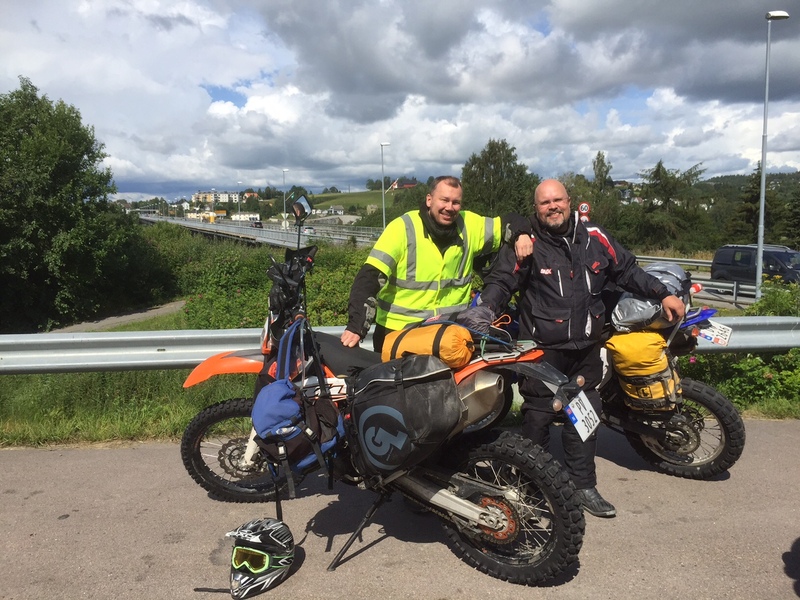 Reaching Kirkenes after 7 days of gravel. We felt it like quite an accomplishment. 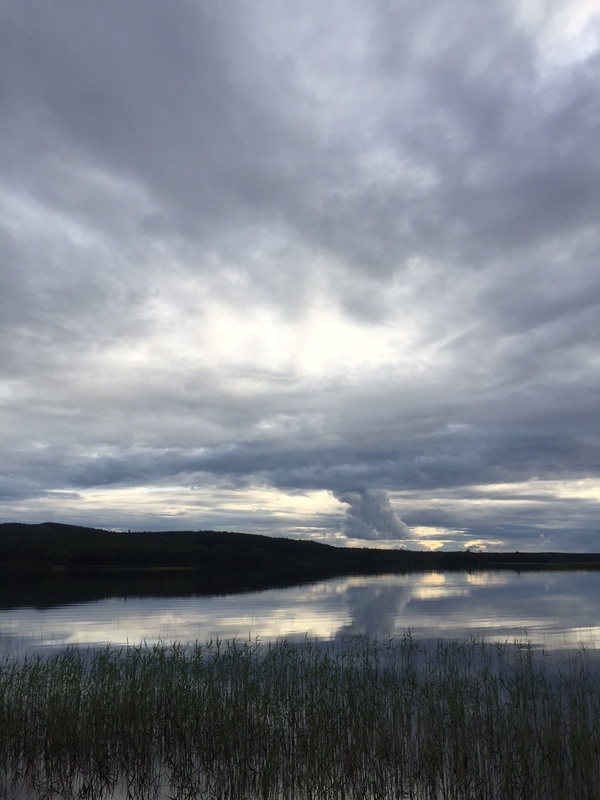 Nikita stayed on in Kirkenes and did a trip to Nikel and Murmansk. He speaks Russian, so it was practically a must for him to go there. 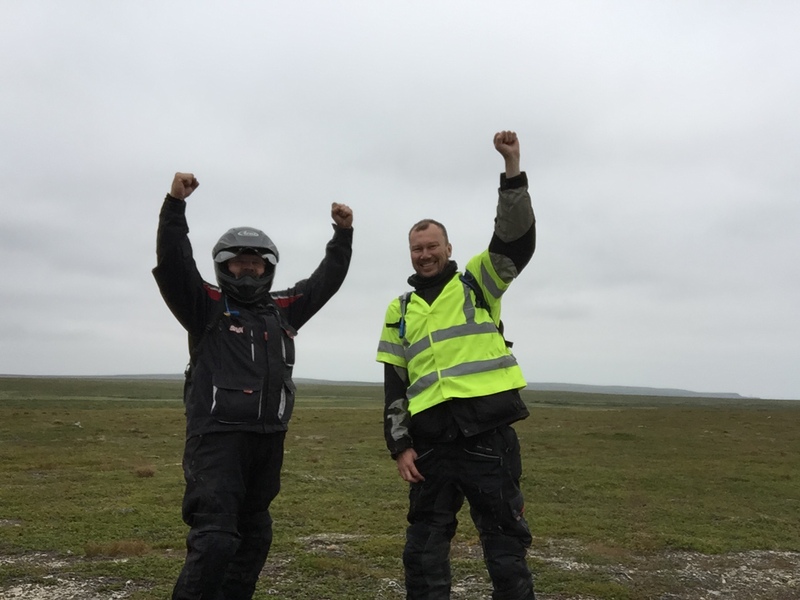 Arne and I went on to the Varanger peninsula to try out the gravel roads there, and made it for a fast return on asphalt down south after a couple of days. 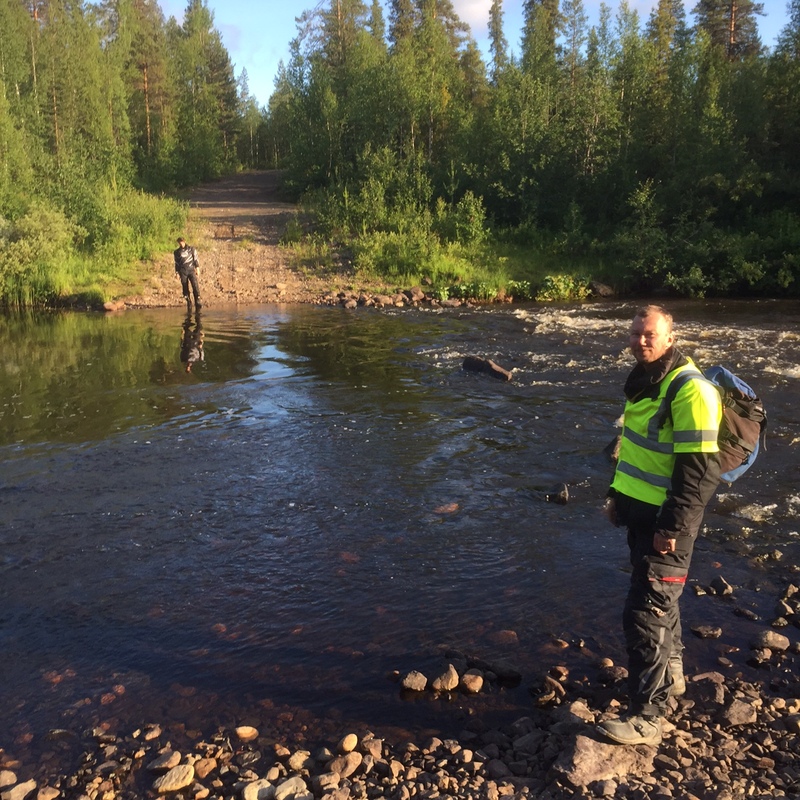 Whereas Arne aimed for a week at the Bukkerittet gravel bonanza, I headed home to have a few days off before starting work again. What I can say, though, is that my Yamaha WR250R was a really good choice for a trip like this. 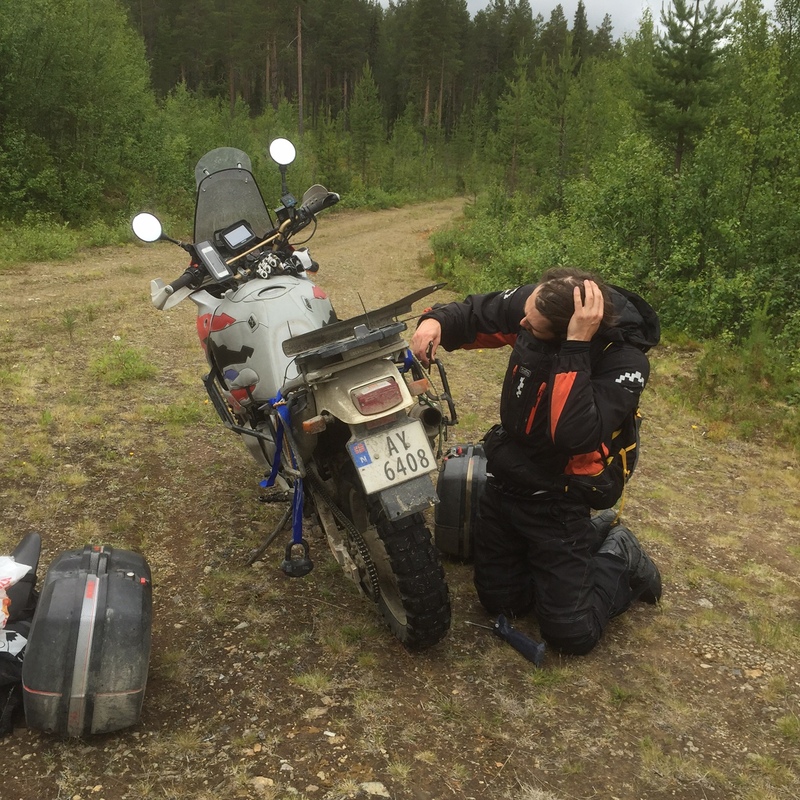 I was especially glad for chosing that bike when I was stuck in the mud somewhere in Sweden, and could lift the bike out to get going. 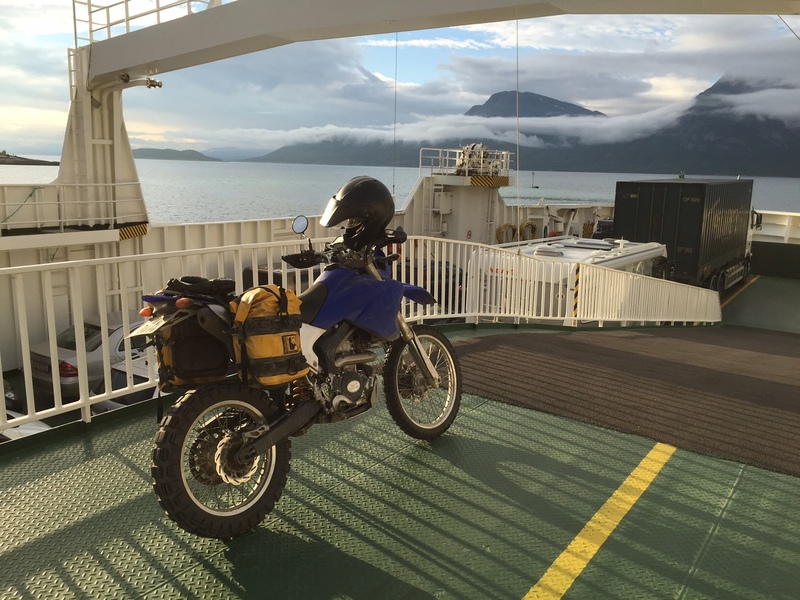 So if you want to do a trip like this: Choose your bike wisely! 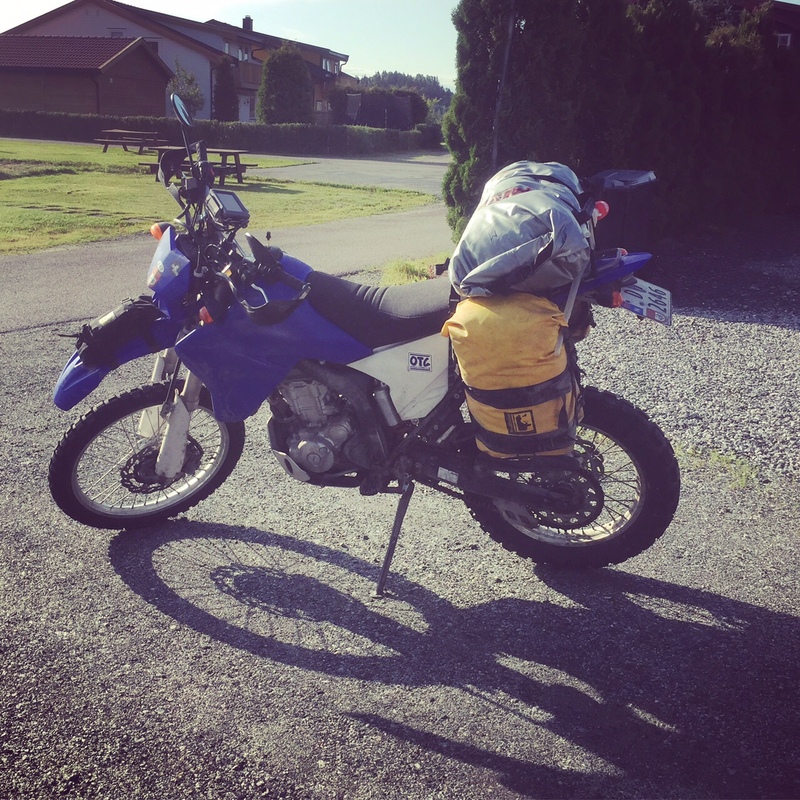 Staying the night at a couple of good biker friends in Nord-Trøndelag county, Liv and Merete. Another ferry on my way southbound. Troms county had put on its finest colors to greet us. 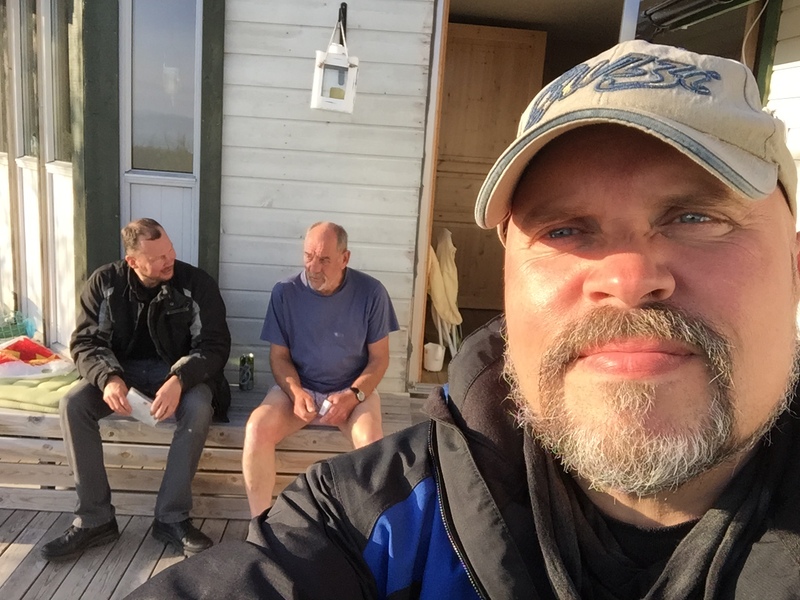 Yours truly, Arne and my brother-in-law Fritjof awaiting for the sauna to get warm enough. Vadsø in Finnmark has the highest density of saunas in Norway – or so they claim. Vardø in Finnmark county was the scene for quite a few brutal execution of people accused of witchcraft during the 16th century. They were all burnt, and this monument is raised to their memory. End of the road. Hamningberg in Finnmark county. 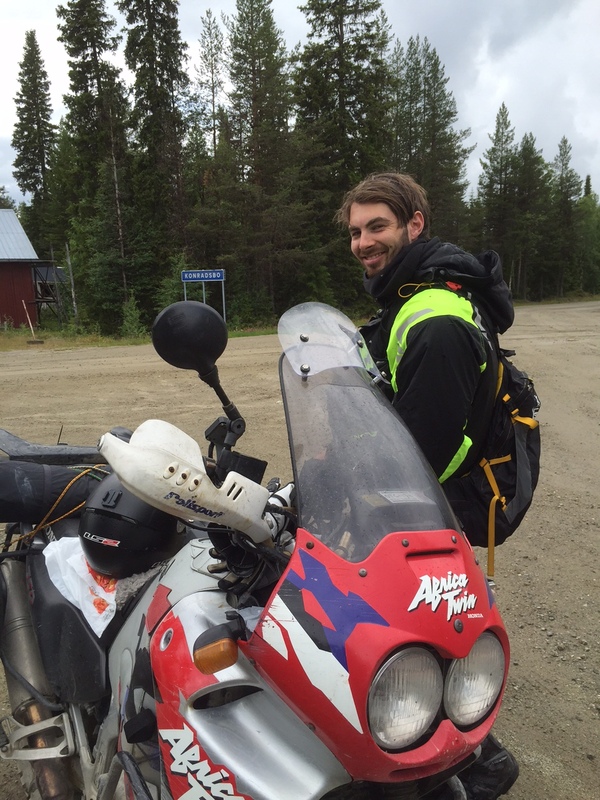 Arne at a road crossing somewhere on the Varanger peninsula in Northern Norway. Way to go! 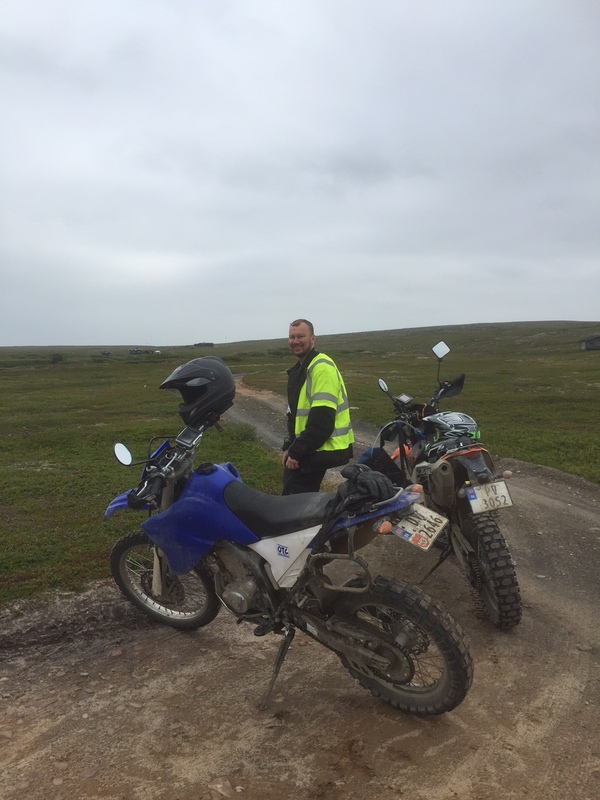 Finnmark county has plenty of nice gravel roads to offer! We saw this beauty at a stay-over in Finland. A Guzzi California 1100. A river we chose not to cross due to depth and rocks. Getting to know the local beer. Nice view over the waters. Nikita at a break somewhere in Sweden. 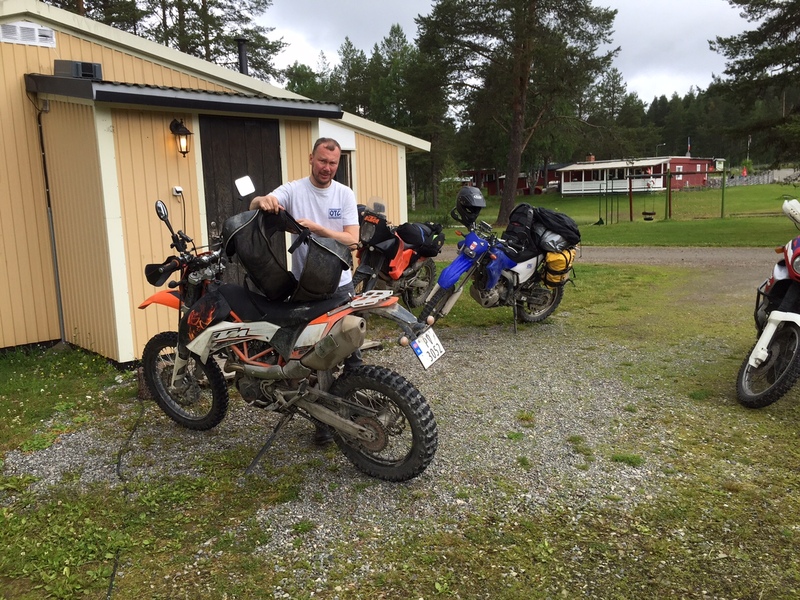 Arne packs his new-to-him KTM 690 Enduro. Chillin’ out after a day’s riding at a camp cabin. A few scares on route: A close call to riding the front wheel into the hole in this broken pipe in the middle of the woods. Fredrik (left) watches as Nikita packs his Africa Twin. My weapon of choice for this trip: A Yamaha WR250R. More than capable of a trip like this. The other weekend I couldn’t resist the urge to get more gravel under the tires. So I headed for Tynset. The Osendalen area is really, really a pearl for gravel riding! There was a hotel based rally going on at the Savalen Spa this particular weekend. Not my usual cup of tea, but it proved ideal to bring my wife, daughter and dog along, as neither of them are particularly fond of staying the nights in a tent. But to here they could drive in my wife’s convertible, bring along the dog, stay in a comfortable hotel room and even have a spa treatment. In return, I could ride my Yamaha WR250R on as much gravel as I could find to the same place. Not a bad deal, after all, as I was looking at some 10 hrs ride each way. I was glad I chose the Yammie as it was light enough for me to manhandle around a few obstacles – not on this road, though. I did some route planning on my Garmin Basecamp software, and decided on a route that was some 70-75% gravel, which is not half bad. It’d take me through some magnificent areas in the midst of Southern Norway, and even across the Birkebeiner road. Yep, I was looking forward to this one! I opted for the Yamaha as it is quite a bit lighter than my KTM, and also had Garmin Zumo 660 already in place. I thought that as I was riding alone, I wanted as light a bike as possible, just in case of spills or other incidents where I’d have to manhandle the bike. road was closed. “Because there is still some 2 meters of snow on the top, and they haven’t cleared it yet. Maybe next weekend”, was the reply. 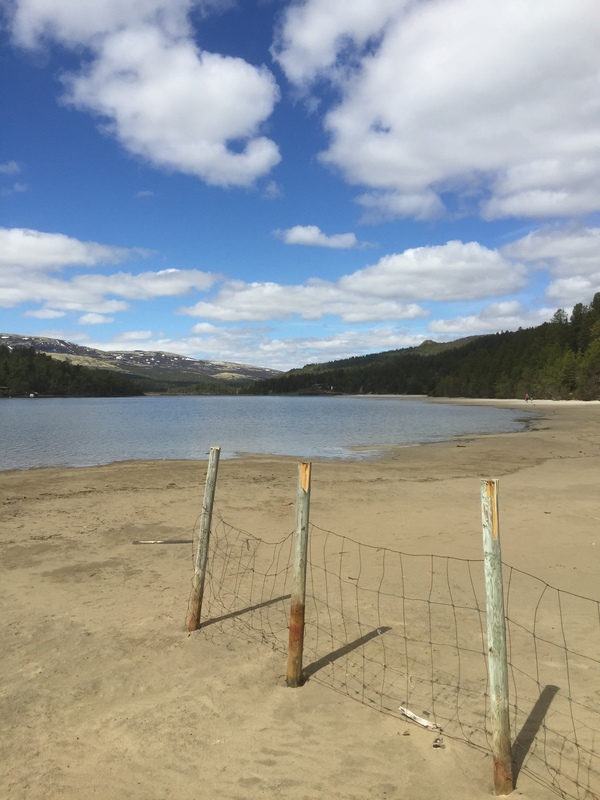 I was a bit astonished, but then again not really: It has been the coldest, wettest and snowiest spring in Norway since 1946, and there is still a lot – A LOT – of snow in the mountains. I had no option but to find an alternative route. As I was running a bit behind schedule and I needed to get to the hotel in reasonable time, I called it the day and went “high speed” along the tarred roads. It was only the last 150-160 kms of a total of 555 kms anyway, so it was fine. Very sweet gravel roads on the route I found. 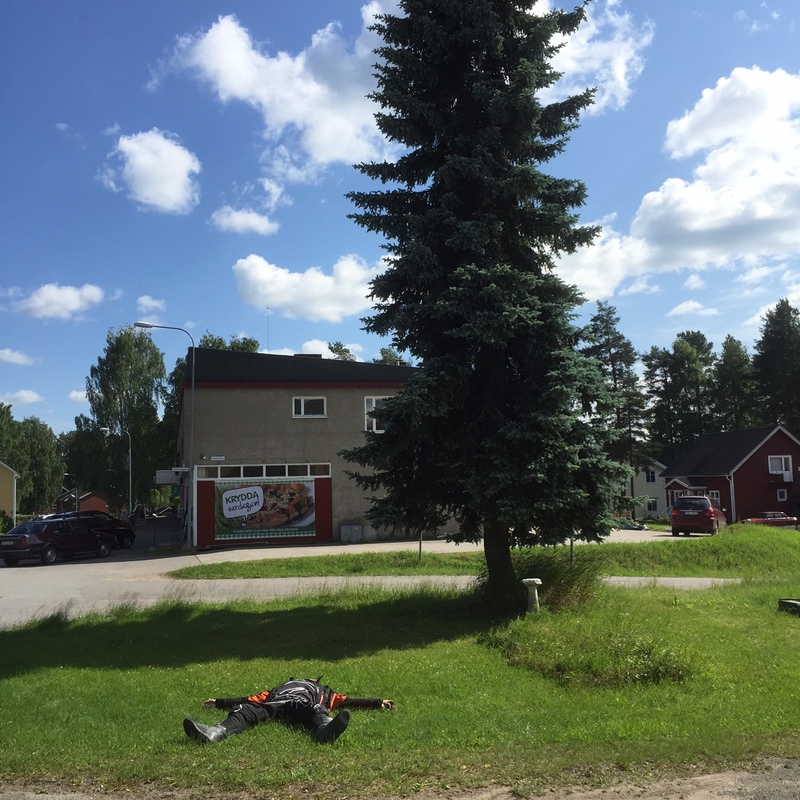 I arrived at Savalen some 10 hours after my departure, and I suddenly felt that I had been riding all day: All stiff and a wee bit sore here and there. A nice dinner and a glass of wine later I was sound asleep, even with my dog yapping all around the place. The rally in itself was ok, I guess. Not too many attendees, but nice folks and good music on Saturday evening. I opted for a ride-free day to recuperate and get ready for the return ride on Sunday, so we had ourselves another great dinner, some wine, music, a few laughs and hit the hay in due time for an early-ish departure. Nice old cabins decorates the area. The return was not so gravelly as the trip to Savalen, but some 200 kms in total wasn’t half bad. 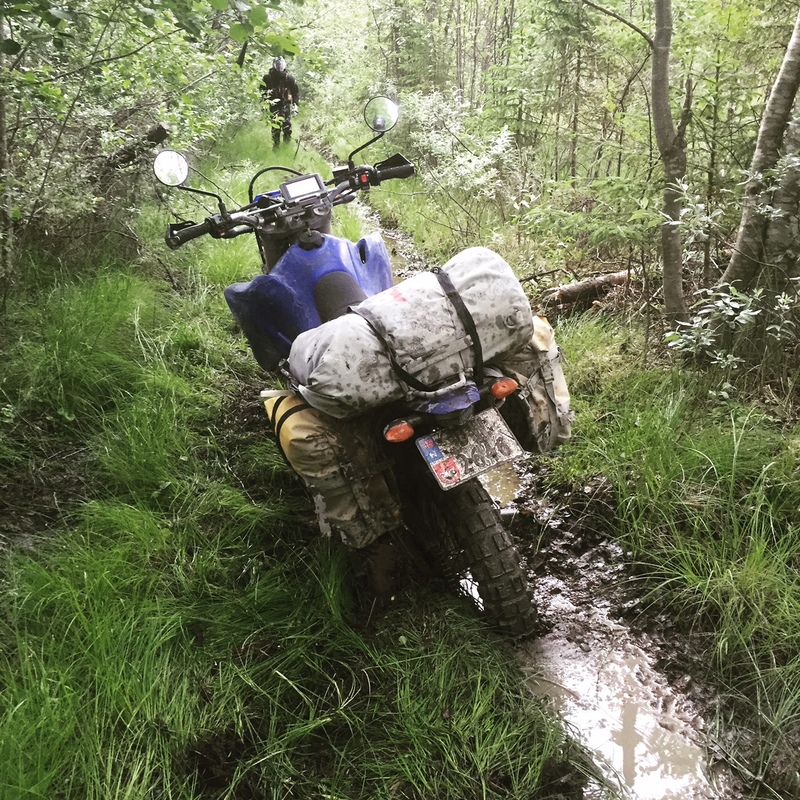 I know several of the guys in the Offroad Touring Club (OTC), which I am a member of, know these neck of the woods pretty good and know the good routes. But I hadn’t had the time to consult The Elders, so given that I think I fared pretty well. 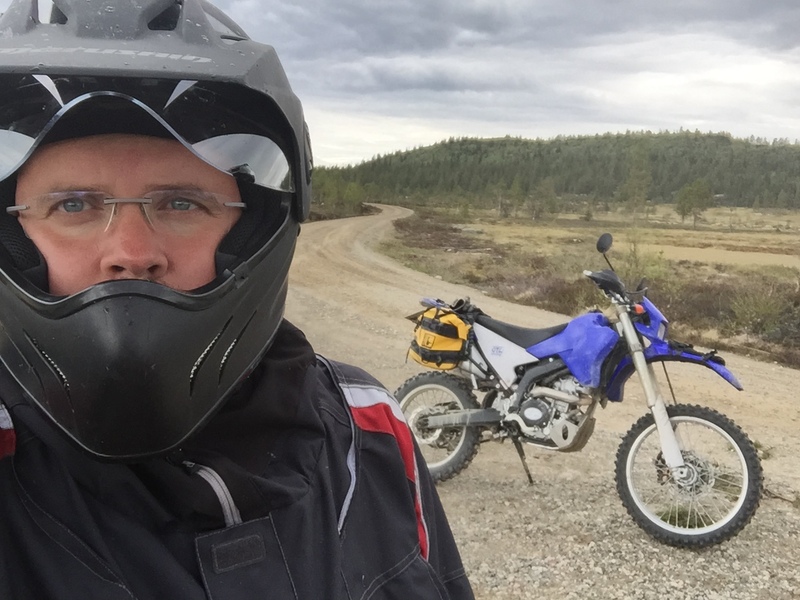 Besides, I heading back to the area in August, when OTC has its annual “Bukkerittet” – a four day gravel bonanza with plenty of roads to enjoy. Nice scenery by the lake at Savalen. 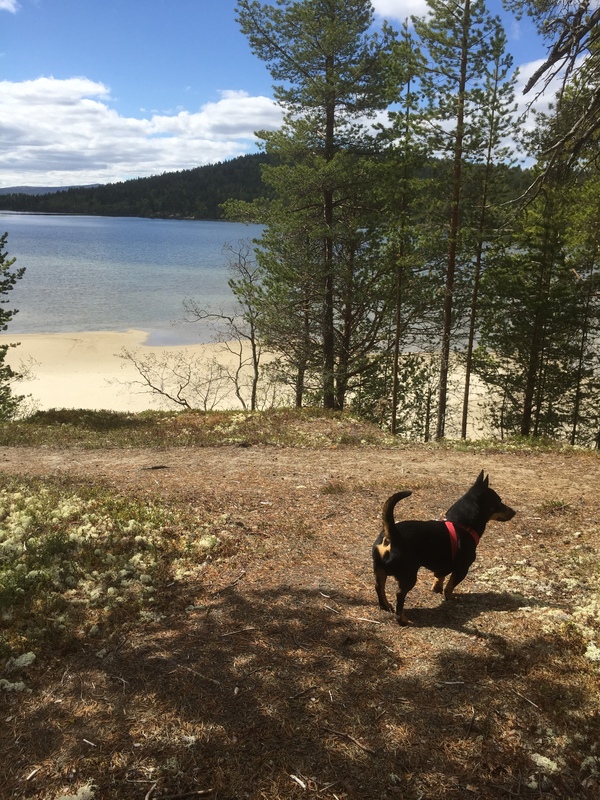 My dog Diesel enjoyed the stay at Savalen.